Beautiful and comfortable apartment set in the heart of the city, walking distance from Piazza del Popolo, and Piazza di Spagna, near transports that will allow you to reach the other parts of the city, near shops and restaurants. Independent heating, AC, dishwasher, microwave, Ipod system, TV, dvd player, internet WiFi, hair dryer, elevator. This lovely apartment has just undergone an elegant renovation. You will find it on one of the Via Margutta. This is one of Rome’s most ancient and quiet streets. You’ll be absolutely enchanted by the view over Rome’s colorful rooftops and cupolas. You can access the apartment on the second floor of an eighteenth century building. It does not provide a lift. You can relax after a long day of sightseeing in the cozy living room. This features a stylish sofa, armchairs, coffee tables, and flat screen TV (with DVD player). The black sofa bed can sleep 2 if needed. 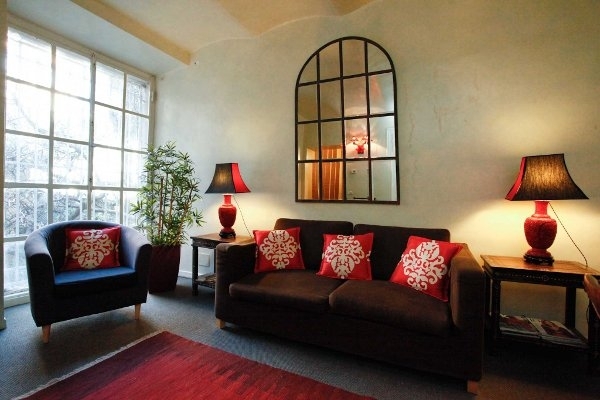 This room also offers a beautiful wide window overlooking a private courtyard. The master bedroom has an extremely comfortable king size bed, night tables and lamps. It also offers its guests an en-suite bathroom. You will moreover have access to the air conditioning in this room. From the master bedroom, you can enter the charming private courtyard. Here you can enjoy reading your newspaper in the morning. Alternatively, especially in summer, you can relax here in the balmy Roman evenings. The apartment also features a fully equipped kitchen. For example, you can make use of the gas stove, fridge, freezer, and a microwave. Here you can prepare delicious home-cooked meals to enjoy at the round glass table in the living area. This Spanish Steps stylish apartment is perfect for guests who want to stay within the exciting historical center of Rome. Despite the central location, however, this apartment allows its guests to also enjoy some quieter moments at home. It is next to the Spanish Steps, Piazza del Popolo, Piazza Barberini, and Villa Borghese’s park. This is one of Rome’s premium shopping areas. Try the Vias Frattina, Condotti, della Croce, di Propaganda, or del Babuino if you want to enjoy couture and high-quality fashion. Moreover, after a hectic day of shopping in some of the most fashionable streets, there is no better place to relax! Equally stylish and elegant bars and restaurants litter the streets of this district. Moreover, it lies on the Metro A line. This gives you direct access to the central station, Termini, and also the Vatican City. Changing from metro A to metro B at the former, you can also reach the Colosseum within a few minutes. Another great way to spend an afternoon is heading to the Villa Borghese park. Here you can relax on its shaded lawns, or hire a boat out on its small lake. This is also a great place for children, who can release some energy in this green oasis. Don’t forget to also enjoy the view from the park’s Pincio Terrace. From here you can see out over the Piazza del Popolo as well as Rome’s Prati district. In the evenings, why not wander over to the Trevi Fountain. This is lit-up at night time, giving it an almost celestial glow. I’m back in the States now and just wanted to let you know that everything went smoothly with both my apartment rentals in Rome (Pincio in Spagna, with contact Barbara Lessona, and the Margana apt., with contact Ilaria Palmeri). Both contacts were responsive and friendly, the locations were great, and the Internet worked well in both. — Re the Pincio apt near Spagna: Lovely location, friendly and responsive representative, and nice glimpse of greenery from the window overlooking the courtyard. But renters may wish to know that the apartment feels rather bare, and not homey. Just a few more furnishings — a coffee table, for instance, and some more artwork on mostly-bare walls — would warm it up considerably. We stayed at this flat for 5 days and loved the sites and transport location, quality and quiet location despite being less than two blocks from the Piazza di Spagna. Would recommend for any couple or group of friends coming to Rome. Nicely updated living and kitchen space. Would stay here again! Location was perfect!!!!!!!!! Apartment is great. Only needs a little paint retouch and could not find iron/ironing board. It would also be perfect if there was a washing machine especially if stay is long. I would definitely stay again and would recommend it. We stayed 6 nights in October 2015 at the Spanish Steps, charming apartment, booked via the Internet. The booking process was smooth and we took advantage of the additional services: airport pick up, the breakfast basket (for Sunday morning) and private tours to the Colosseum and Vatican. We found the apartment quite satisfactory, a bit dark in the day, and the internet stopped working after 4 days, but location made up for these shortcomings. Via Margutta is a wonderful street to stay on, it and was only minutes to walk to the Spanish Steps and the Piazza del Popolo. We loved our tours and would highly recommend the luxury of a private guide if possible. If nothing else, she kept our 13 year old engaged and polite!